Joseph A. McPhillips first met Paul Bowles and his wife Jane Bowles in 1962, shortly after he moved to Tangier, Morocco, when he accepted a job as English teacher at the American School. In 1972, he was appointed the Headmaster of the school. McPhillips became the executor of the estate of Paul Bowles upon Bowles' death on November 18, 1999. He arranged for Paul Bowles' funeral in upstate New York on November 1, 2000. Read a short biography and obituary of Joseph A. McPhillips III below. Other photographs on this page are of the American-born painter Marguerite McBey at El Foolk, her villa on the Old Mountain, where she entertained Jane and Paul Bowles and many others during the six decades she lived in Tangier. The Honorable David Herbert was born into an aristocratic English family and moved to Tangier permanently in 1946. Herbert was truly a one-of-a-kind individual throughout his forty-nine years in the city, entertaining his many friends and guests. For decades David Herbert was the social arbiter of Tangier society, and he helped to decide who would and would not be invited to Barbara Hutton's lavish parties at Sidi Hosni, her palace in the upper medina. Herbert was particularly fond of Jane Bowles, whom he affectionately called "Janie". The photographer Cherie Nutting was one of the closest woman friends of Paul Bowles during the last 15 years of his life. They collaborated on a book of her photographs, Yesterday's Perfume: An Intimate Portrait of Paul Bowles, published in 2000. That book contains some of Paul Bowles' last writings, including several essays and numerous hand-written picture captions. Joseph A. McPhillips III was a longtime Headmaster of The American School of Tangier. He was born in Mobile, Alabama on March 27, 1936, and he was raised in Point Clear, Alabama. After graduation from Phillips Andover Academy in Massachusetts, he went to Princeton University in New Jersey and graduated in the class of 1958. Beginning in 1959 and into the early 1960s, McPhillips travelled throughout parts of Central and South America and several countries in North Africa and Europe, accompanied by John Hopkins, a Princeton classmate and friend. In 1962, he accepted a job in Morocco as an English teacher at The American School in Tangier. McPhillips was appointed the Headmaster of the school in 1972, a position he held for 35 years. He was particularly proud of and devoted to his school's annual dramatic productions, which he directed and produced. Paul Bowles composed music for nine of the plays. Another friend, the couturier Yves Saint Laurent, flew to Tangier from Paris to design the actors' costumes for Hippolytus. The play was performed in both English and Arabic in June 1992 at le Palais du Marshan. In 1995, McPhillips established a sister school to AST―The American School of Marrakesh―or ASM. The school's beautiful campus was designed by the highly-acclaimed Tunisian-born architect Charles Boccara, who now lives in Marrakech. 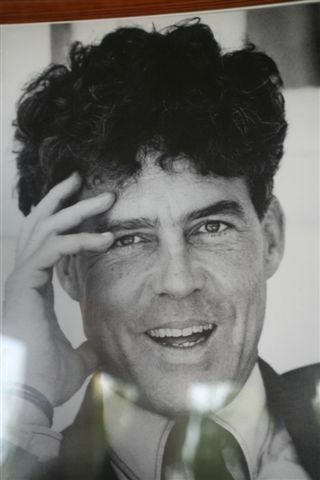 Joe McPhillips' many friends included Jane Bowles, Paul Bowles, artist Marguerite McBey, playwright Tennessee Williams, Beat writers William Burroughs and Allen Ginsberg, film director and screenwriter Oliver Stone, Moroccan Princess Lalla Fatima Zohra, designer-architect Bill Willis, singer and entertainer Jimmy Buffett, philosopher and journalist Bernard-Henri Lévy, fashion editor Diana Vreeland, Pierre Bergé, Frank G. Wisner, former American vice consul in Tangier and Joseph Verner Reed, former U.S. Ambassador to Morocco. McPhillips was the executor for the estate of Paul Bowles after Bowles' death in late-1999, and he arranged for Paul Bowles's funeral. McPhillips personally brought Paul Bowles' cremated remains to Lakemont, a small town in upstate New York for burial on November 1, 2000. Joseph A. McPhillips III died in Tangier, Morocco on June 11, 2007. He was 71. His unexpected death, five days before his school's 57th commencement, was the result of a heart attack and fall at Gazebo, his home on the Old Mountain. On June 15, 2007, a funeral service and memorial for Joseph A. McPhillips III was held at the Spanish Cathedral in Tangier, attended by several hundred friends, students, admirers and family members. Remembrances were given by Christopher Gibbs, John Hopkins and his longtime secretary Blanca Nyland Hamri, among others. After the service, he was buried at Boubana Cemetery in Tangier. He is survived by a brother, Dr. Frank L. McPhillips of Mobile, and a sister, (Carolyn) Lynn Meador, of Point Clear, Alabama. Joe, as his close friends called him, lived 45 years in Morocco. Joe McPhillips, the longtime headmaster of the American School of Tangier. Joseph A. McPhillips III, a longtime friend of Paul and Jane Bowles and the Headmaster of The American School of Tangier, at Gazebo, his villa on the Old Mountain, 1993. McPhillips in New York for the September 1995 Paul Bowles Music Festival held at Lincoln Center's Alice Tully Hall and The New School for Social Research. The events were organized and sponsored by Jonathan Sheffer, founder and conductor of the EOS Orchestra. The American-born painter Marguerite McBey, a resident of Tangier for over six decades, sits under a portrait of herself by her husband, the celebrated Scottish etcher and artist James McBey. She lived at El Foolk, in Tangier, Morocco, and had another home in London. The Hon. David Herbert, who Paul Bowles termed "Tangier's social arbiter", at Dar Kharoubia, his home on the New Mountain. David Herbert was born into an aristocratic family in England on October 3, 1908. His full name was David Alexander Reginald Herbert, and he was the second son of the Fifteenth Earl of Pembroke and the Twelfth Earl of Montgomery, and the Countess of Pembroke. As a child he was raised in Castletown, Ireland, and at age four Herbert moved to England, when his father inherited the family's ancestral home, Wilton House, near Salisbury in Wiltshire. It is considered one of the great country houses in England and a fine example of Palladian architecture. Wilton House contains numerous paintings by Van Dyke and Reynolds, a Rembrandt and a collection of ancient sculptures. In 1554, King Henry VII gave the original buildings and 60,000 acres of land to Sir William Herbert. At age nine David Herbert went to a preparatory school at Wixenford, and later he was sent to Eton. In 1932, David Herbert first traveled to Tangier with a friend, Cecil Beaton—the photographer preferred by British royalty. In the early 1930s, Cecil Beaton encouraged his friend to paint portraits, and Herbert later painted Rose Kennedy, the mother of the American President John F. Kennedy, and her daughters. Throughout the 1930s, he continued to visit Tangier and other cities in Morocco. In October 1946 Herbert took up permanent residence in Tangier. In 1948 he first met Jane and Paul Bowles when they were staying at El Farhar with Truman Capote and Jack Dunphy. David Herbert was indisputably—for nearly half a century— the pre-eminent host in Tangier's social life. Herbert scrutinized the guest lists for his friend Barbara Hutton, the Woolworth heiress who held lavish parties each summer at Sidi Hosni. In addition to Paul and Jane Bowles, some of Herbert's prominent friends included the Duke and Duchess of Windsor, Prince William of Gloucester, Ian Fleming, Noël Coward, Christopher Gibbs, Malcolm Forbes, Lady Diana Cooper and Sir Winston Churchill. Herbert's sister, Lady Patricia Smith, the Dowager Viscountess Hambleden, served for fifty-seven years (from 1937 to 1994) as a Lady in Waiting to Her Majesty Queen Elizabeth, the Queen Mother. As a devoted, life-long friend of Jane Bowles, David Herbert once said that if anything ever happened to Paul, he would have married "Janie," as he called her. While a houseguest at Wilton in 1949, Paul Bowles was shown photographs of an intriguing, two-acre tropical island in the Indian Ocean—Taprobane. Herbert's family had stayed there in the 1930s. Paul Bowles first traveled to Ceylon in 1950, and he bought the island in 1952. David Herbert was the author of three books: Second Son: An Autobiography, 1972; Engaging Eccentrics: Recollections, 1990; and Relations and Revelations: Advice to Jemima, 1992, a book of memories and advice to his great-niece Jemima. David Herbert was born on October 3, 1908; he died from kidney failure in Tangier on April 3, 1995, at age 86. His funeral service was held at Saint Andrew's Church and he is buried in the cemetery there, where his tombstone reads simply: "He loved Morocco." The Hon. David Herbert with Paul Bowles in 1989 at Villa Mabrouka, one of two Tangier villas then owned by Sheikha Fatima Fahd al-Salim al-Sabah of Kuwait. Villa Mabrouka is located on the Marshan and has Mediterranean sea views, a large swimming pool and a stucco pavilion that was designed by the talented American-born painter and architect Stuart Church, a resident of Tangier since 1960. Church's most recent design project is the ultra-luxurious Taj Palace hotel outside Marrakech, scheduled to open on January 15, 2013. Villa Mabrouka later was the Tangier residence of the late couturier and fashion designer Yves Saint Laurent and Pierre Bergé. Yves Saint Laurent's spring-summer 2006 menswear collection and YSL's spring-summer 2011 men's collection by Stefano Pilati were inspired by the life, style and work of the expatriate American writer and composer Paul Bowles. Impeccably dressed, Bowles once took a suitcase full of neckties on a trip into the Sahara. In the mid-1990s, images of Paul Bowles were used in American advertising campaigns for the retail clothing chain The Gap, with billboards on New York City Transit buses and subways. Several magazines featured full-page advertisements with the slogan: "Paul Bowles wears khakis." A decade later, Italian clothing designer Roberto Cavalli's spring-summer 2008–2009 menswear collection was partly inspired by Paul Bowles, among others. And designer Antonio Marras revealed that he was also inspired by the Sahara as depicted by Paul Bowles and Eugène Delacroix for the Kenzo 2010 spring-summer women's fashion collection. (Photograph copyright © 1989 by Cherie Nutting). The Hon. David Herbert's tombstone in the cemetery at Saint Andrew's Church in Tangier. It reads simply: "He Loved Morocco". David Herbert was a social legend during the more than 50 years he lived in Tangier. Photographer Cherie Nutting sits next to Paul Bowles in the medina of Asilah, Morocco in 1993. She married a Moroccan musician, Bachir Attar, after first meeting him at Paul Bowles's apartment. After parting amicably, Nutting and Attar remain friends, and she now manages the group, arranging tours, concerts and other performances of the Master Musicians throughout the world. Actor John Malkovich, photographer Cherie Nutting and Bachir Attar, leader of The Master Musicians of Jajouka, Italian filmmaker and cinematographer Bernardo Bertolucci and actress Debra Winger during the filming of Paul Bowles's The Sheltering Sky, in Ouarzazate, Morocco, 1989. Paul Bowles' Friends: Next (Part Two); Part Three; Part Four; Part Five. Return to galleries listing.